Solar Impulse HB-SIA, the first solar powered aircraft have finished the first trip successfully starting from Europe to Africa then back to Europe. 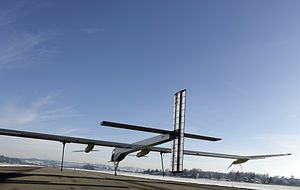 The story of Solar Impulse started back to 2009 when the Swiss long-range solar powered aircraft was ready to be tried, it was first tried in Switzerland, and then on May 2012 the trip to Africa started. As anticipated, the Solar Impulse HB-SIA experimental solar-powered aircraft completed the first ever solar-powered intercontinental roundtrip journey between Europe and Africa today. The roughly 6,000 km (3,728 mile) trip commenced on May 24 and consisted of a total of eight legs averaging 800 km (497 miles) before reaching its conclusion with a landing back where it all began in Payerne, Switzerland at 8:30 pm on July 24, local time. The final leg of the journey was piloted by Bertrand Piccard, who shared duties in the single-seater cockpit with André Borschberg over the course of the journey. Originally built to prove that an aircraft powered only by the sun’s rays could be flown at night, which it proved in 2010, the HB-SIA prototype aircraft has continued to rack up a number of solar aircraft distance records. Over the course of its latest record-breaking journey, the aircraft visited Madrid, Rabat, Ouarzazate, and Toulouse. Although its 400 kg (882 lb) of lithium batteries give it the ability to fly through the night, it often landed after midnight to avoid thermals. However, the Solar Impulse team says the aircraft was almost always brought back to the hangar with the batteries almost fully charged.